The first rule of True Fight Club is... oh forget it. Save the tired clichés, and focus on the sport! TFC's Muay Thai class is a fantastic opportunity to learn valuable self-defense skills while getting into the best shape of your life. Known as the "Science of 8 Limbs," Muay Thai it utilizes 8 points on the body: the fists, legs, knees, and elbows. In this all-levels class, you'll strengthen your core and tone your body, while building yourself up to perform explosive moves. 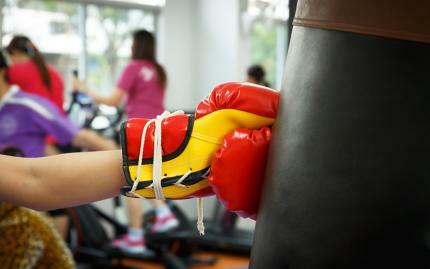 Your aerobic capacity will increase, you will develop motivation and self-discipline, and you'll just plain feel good. Best of all, the first class is free, so you don't have to commit to anything until you're sure you love it. Try it out today!